Thousands of people visit the open air market from Wednesday to Monday. 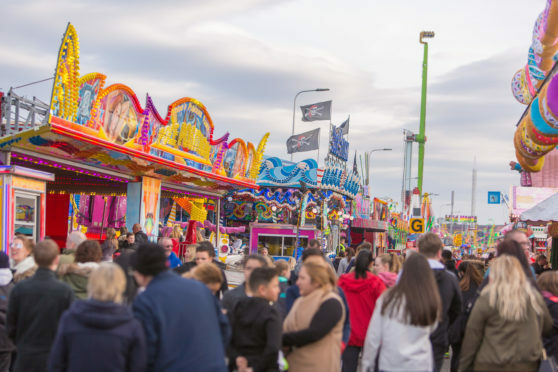 Locals and visitors to the Lang Toun can lap up all the fun of the fair from Wednesday afternoon until next Monday night, and the fact is probably not lost on most parents that the market’s arrival coinciding with Easter holiday boredom will probably have kids more excitable than usual. As far as I can remember, it’s always been a polarising thing in Fife, with some people loving the spectacle of it all and some others just absolutely loathing it. The history of it makes it something special, as it is said to be arguably Europe’s longest street fair and the oldest in Scotland, having been established in 1304. It was always a great thing to behold as a child, discussing what new rides were there over lunch break at school before heading down as many nights of the six-day extravaganza you could. It was also a great place to catch up with friends, and that’s actually still true to this day – albeit most of us have moved on to becoming mums and dads of our own. But that won’t stop the other side of the argument from raging against the Links Market machine. Traffic chaos, roads closed, the hefty price tags attached to the rides and stalls, the litter, the sickness, and not to mention the throngs of people crammed in like sardines at peak times – yet people still think it great to take ginormous prams along for the walk or casually wave lit cigarettes around. Having said all that, while the market is like Marmite to most people, it’s got a special place in Fife’s folklore and regularly attracts thousands of people to the area – boosting local businesses into the bargain. One has to wonder though if, like everything else that has a history these days, the Links Market’s days – as we know them anyway – are numbered. I sincerely hope not, but with changes proposed to the layout of Kirkcaldy Esplanade and other developments in the pipeline putting the squeeze on it, as well as the uncertain impact of Brexit on freedom of movement and therefore attractions coming from Europe, there is a danger that the event may dwindle and might not be the same as it once was. Like everything else, the Links Market has had to evolve over the years to stay as relevant as possible, and it’s done a great job of staying attractive to youngsters and families despite the cost and the growing number of devices – consoles, phones, tablets etc – competing for kids’ attention these days. It’s a challenge that isn’t going to get easier by the looks of things, but you’ve got to admire the creative ways the showmen and women come up each and every year to get the punters in.